The monk brings me dinner on two red trays. 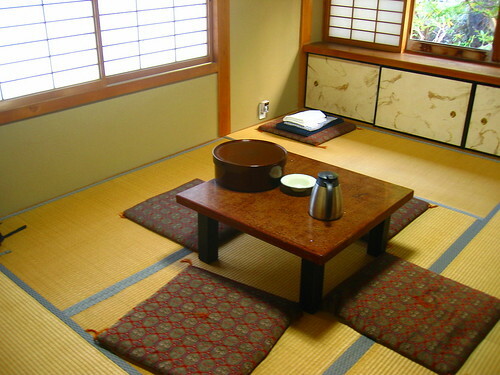 The rice, tea pot and the bottle of sake sit directly on the tatami of my room, and so do I, cross-legged. The food (called shojin-ryori, or “cuisine of purification, devotion”) is supposedly austere in such temples, but the definition of austere has definitely been stretched here. Indeed, the vegetarian meal is plentiful, varied and delicious. 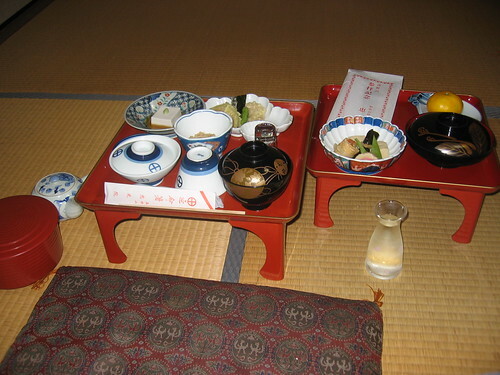 Sesame tofu and “Koya tofu“, tempura of vegetables, a clear soup, soba, rice and various pickles. When I hear shouts outside, I slide the paper panes to peer into the night. Men in festival clothes carry an illuminated portable shrine into the courtyard of the neighboring temple, swinging it up and down while singing, before they disappear into the darkness. Soon after, it is time to go and take a bath in the common furo. I put on my yukata and a pair of geta, get out and cross the inner garden, guarded by the quiet tricking of the pond under the naked stars. The night is getting cold. 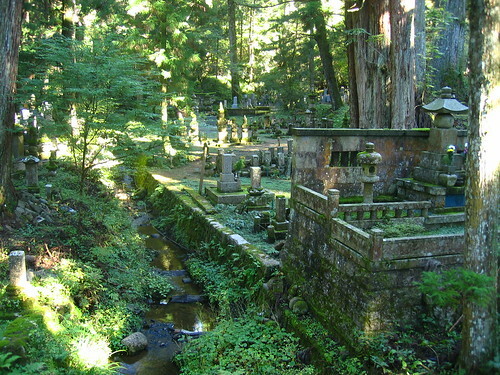 The Buddhist village of Koyasan is nested in wooded mountains in the south of Osaka. 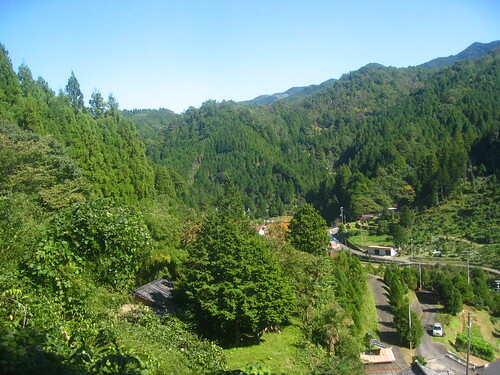 It takes a train ride through valleys and hamlets to get there, not unlike the Swiss Alps except that the forest is denser, mostly pine trees and occasional bamboos, and the mount peaks rather blunt. Before dinner, I went for a quick dusk walk in the large cemetery that leads the way through the forest to the Okuno-in temple and Kukai’s mausoleum. 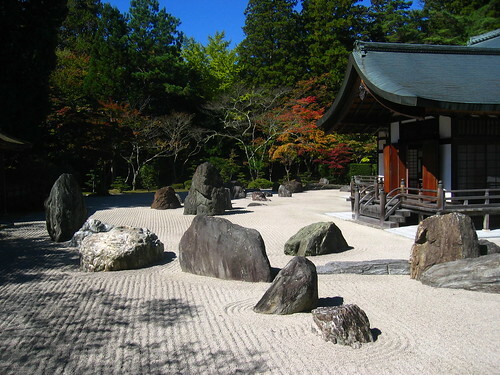 Kukai is one of the founders of Japanese Buddhism, and all the tombs contain ashes or hair of believers who hope to be resurrected when he will awaken again. The place reminds me of Nara: a peaceful testimony of ancient times. The smell of old stones, forest and incense, the fresh air of the mountain and the silence, save for a few birds and flowing water. And lanterns, some lit, and thousands and thousands of gravestones of various age, covered in moss, and endless panorama of vegetation and marble, with the punctual explosion of colors of statues wearing red clothes and flowers, yellow, blue or purple. I’m awake at 6:15 the next morning, ready for the meditation hour with the monks and the other guests of my shukubo (temple lodging visitors and pilgrims). We get out, shivering of the cold temperature, promptly climb the stairs to the wooden temple. The panes are slid shut behind us while in front, three monks light incense and start singing in the subdued light of the uncountable lanterns. The monotonous melodies go on, only occasionally accompanied by cymbals and a deep bell, with the three voices perfectly in tune. All guests sit cross-legged and watch and listen. Like the many other foreigners, I absorb the magic of the ceremony without any idea of its actual nature. We then move to a small room in another temple, where one month sings alone, banging a drum, while another lights incense and prepares a fire, soon burning hard in the middle of us, on which he drops leaves, oils and other preparations emitting a rainbow of fragrances. When the singing is over and the fire burnt out, we’re invited to inhale the fumes and walk around the ashes. Of course, we share frustration over our ignorance of the signification of the rites we have just witnessed. But given the wide variety of Buddhist cults and sects, and the ubiquitous but relatively loose daily practice of religion in Japan, it remains uncertain whether the scene was any less cryptic for the average Japanese. Much like Western people watching Ghibli animes and interpreting the intense fireworks of shinto symbols as joyful fantasy elements, we could only read this beautiful but obscure ceremony as an exotic spectacle projecting the shadow of an entire other world, unknown to us but evolved over centuries, far from all our Judeo-Christian references.